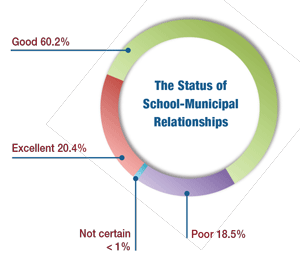 A survey of school and municipal officials, shows cooperation where – and where not – expected. School district-municipal cooperation thrives throughout New Jersey, in spite of limited state funding, local property tax burdens and the need to make ends meet in the face of the state’s 2 percent tax levy cap. In fact, the financial strains facing public schools and local governments make dialogue and cooperation essential elements in maintaining the level and quality of services. These were among the findings of two consecutive annual surveys conducted by the New Jersey School Boards Association and the New Jersey State League of Municipalities (NJLM). The survey results formed the basis of panel discussions, moderated by the organizations’ leaders and featuring school and municipal officials at NJSBA’s annual Workshop and the League’s statewide conference in 2014 and 2015. “This year, our questions asked about shared services and their impact on the ability of school districts’ and municipalities to comply with the state’s 2 percent tax-levy cap,” Donald Webster, Jr., NJSBA president, explained during the 2015 presentation. Webster also serves as president of the Manchester Township Board of Education in Ocean County. The impact of shared school-municipal services on the ability of both units to meet the requirements of the 2-percent levy cap. “Because the relationship between the school board and the municipal government is critical to the success of any cooperative effort, we also asked our members about the quality of these relationships,” said Webster. One-third of the state’s communities were represented in the survey. Not only do the responses shed light on the status of school-municipal cooperation, but they also provide instruction on how to build and improve productive relationships. Results of the 2015 survey showed a high degree of communication about the cap and financial matters at the community level. 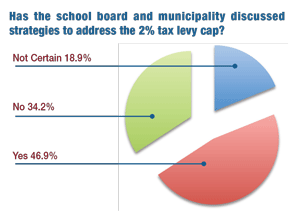 Almost half of survey respondents said school and municipal officials have met to discuss ways to meet the requirement of the tax-levy cap. Over the last several years, both bodies have met to discuss living within the 2 percent cap. As a result, we have entered into many shared-service agreements with the municipality which has not only saved the district money, but enabled us to work cooperatively with each other. The mayor and I meet regularly to discuss ongoing issues including the tax levy, cooperative agreements and areas of shared service. However, we do not have full board meetings with representatives from the township committee. We haven’t met specifically on the topic of the 2 percent cap, but we regularly meet to discuss ways to share and reduce or control costs. Both the elementary school district and the high school regional district present their budgets to the governing body, and we have a dialogue regarding changes in the budget from the previous year. Whether the focus of communications is the 2-percent tax-levy cap, or not, the vast majority of respondents (87.2%) said their school districts and municipalities share services. The shared services most frequently cited should come as no surprise to school board members and administrators: recreation/field use, walking-route safety, and buildings-and-grounds maintenance. However, the survey results also indicated a trend toward school security, technology, sustainability-related efforts and grant-writing. The 2015 survey placed a special focus on technology by asking school and municipal officials for examples of shared services in this area. Most respondents pointed to cooperative use of infrastructure, such as fiber optic networks and intranet, as well as the establishment of emergency alert systems. The municipality, school district and Rowan University have shared broadband. The borough runs ‘Rosenet,’ a fiber that connects all borough and school buildings to one another and to the internet. We manage their Internet, and they ride on our fiber optic lines and provide first response when issues arise. The township broadcasts school board meetings on the public access channel… Media and messaging are coordinated, especially during emergency conditions. 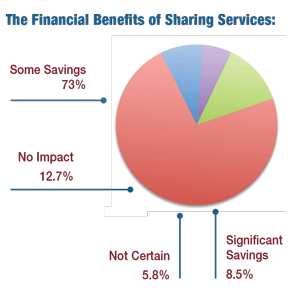 Do shared services pay off? The answer, according to the survey, is affirmative. A wide majority of respondents indicated that their communities experienced at least some savings through shared-service efforts. In addition, over half of the respondents said that shared services helped their school district or municipality stay within the 2-percent tax-levy cap. In addition to financial savings, improved quality is a goal of shared services. Close to half of the survey respondents indicated that sharing has resulted in higher quality services. Additionally, some officials noted that cooperation was driven more by mutual goals and the welfare of the community’s children than by finances. The township provides savings to the district by cutting large lawn areas and fields. They also provide snow plowing in the winter. We are still charged for trash and snow removal. However, it is less than we would pay if we contracted with a third-party vendor. Our inter-local agreement with the regional high school for a school resource officer offsets the salary for that position. We have derived minimal savings, but we have enjoyed a cooperative relationship that makes our management of services and activities more efficient. Without the savings, we would have had to cut some other budget line. We do need to continue to look for savings elsewhere as many other budget lines increase each year. At some point in the near future, all options will be exhausted and the cap will affect classroom instruction. While some savings have been realized, collaboration with the municipality and Rowan University has yielded a value-added and positive perception within the community. The condition of the school fields has improved significantly since a cooperative effort to renovate and maintain the fields was put in place. Athletic fields on school property support school, township recreation, and local non-profit sports programs. The quality of the fields has benefited all user groups. There has been more timely service and better working relationships between agencies. We believe a strong interagency relationship is a key to identifying other possible future services. We have worked together on many issues related to safety, traffic, noise and environment. The town has provided the same services (snow plowing, snow removal and salting) for well over 35 years. The quality has always been outstanding, and they have always responded when called. We have several partnerships with municipal entities to meet various needs. Not all of these partnerships are driven by budgetary concerns. For example, we partner with the municipality’s Human Services Commission to provide supplemental food on weekends and summers to our children who are food insecure. This is not at all because of the 2% cap or to save money. It’s about a shared mission in support of our neediest children, regardless of cost. Other Cost-Saving Tactics The 2015 survey also asked school district and municipal officials about strategies other than shared services that they have used to meet the requirements of the 2 percent tax levy cap, either cooperatively or individually. The respondents provided more than 120 examples in areas such as collective bargaining, energy management and purchasing. Building positive relationships requires effort by both school and town. Survey respondents listed a wide range of strategies that have enabled them to identify mutual goals and better serve their constituents. Examples include formal school district-municipal committees; liaisons between the school board and municipal governing body; regularly scheduled meetings between the representatives of the governing bodies; and facing common issues through a united front. 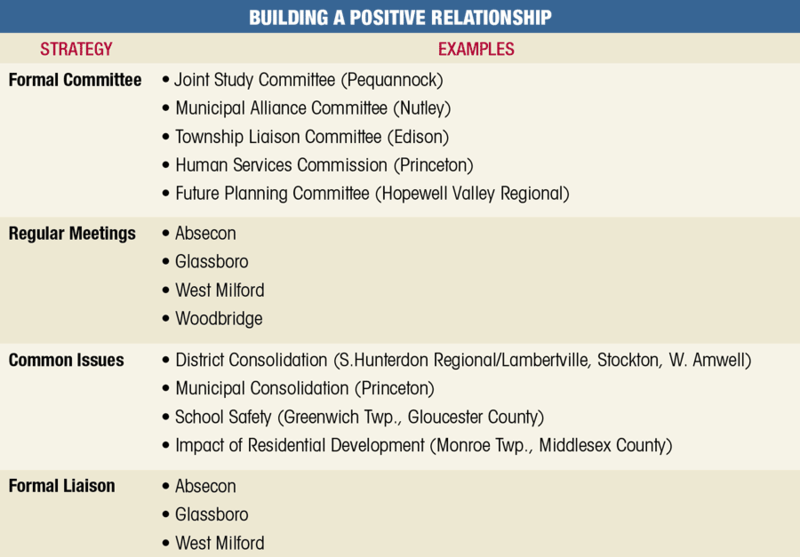 A wide majority of survey respondents characterized the relationship between their school districts and corresponding municipalities as “excellent” or “good.” According to the survey, the foundation for strong relationships was built on two-way communication, shared concerns, recognition of their shared constituencies, and respect for each other’s roles. Joint Planning: “Our new superintendent has reached out to municipal leaders. We are including them all in invitations to our strategic planning sessions. We visit with them to share our budget. Going forward, collaboration will increasingly become necessary and the norm – rather than the exception. In 2014, the leaders of the New Jersey School Boards Association and the New Jersey State League of Municipalities issued a letter pledging cooperation at the state level and encouraging it in the community. “Today, the mutual concerns of schools and surrounding communities, ranging from school safety and security, to energy costs and preserving critical programs in the face of limited resources, will necessitate even more cooperation,” they wrote. 1981 – The League and the NJSBA issued one of the first state-level reports on shared services. Titled, “The Art of the Possible,” it outlined the financial benefits and improved services that could result from school district and municipal cooperation. 1995 – The organizations spearheaded a coalition that brought about the State Mandate-State Pay Constitutional Amendment. The amendment, approved by the states’ voters, is designed to avert the imposition of new state-required expenditures on municipalities and school districts. 2011 – Following enactment of the 2 percent tax levy cap, NJSBA and the League co-sponsored a training program, “Collaborating on Real Solutions to the 2 Percent Cap.” The program featured experts on the economy, education and government services and featured sessions on budgeting, labor negotiations and shared services. 2015 – In June, NJSBA and the League released a study of the property tax impact of a proposal – by the state’s Pension and Health Benefit Study Commission – to shift teachers’ pension costs from the state to local school districts. The analysis, sponsored by our two organizations, was conducted by the Bloustein Center for Local Government Research at Rutgers University. Frank Belluscio III is NJSBA’s deputy executive director and director of communications.